Most artists find their way into art gradually. Their interest develops over several years, often early in their lives. I didn’t arrive at art quite so gradually. In fact, I regarded fiber arts as a not-terribly-important hobby until December 1995. Then a friend handed me a copy of Smithsonian Magazine, saying, “I saw this article and thought you’d find it interesting.” I opened it, and was floored by a photo of the most amazing art I’d ever seen. It was a kimono, Burning Sun, by Japanese artist Itchiku Kubota. At that moment, I knew that what I wanted to do with my life, more than anything else, was to make something as beautiful, powerful, and technically masterful as that kimono. It had never occurred to me that fiber art could be art before – I’d been spinning yarn for sweaters and designing interesting quilt tops, which people thought were artistic. But in my mind, they weren’t art. Kubota’s kimono could stand against the most masterful painters and sculptors. They opened my mind to a whole new world of what could be done with textiles. Alas, Kubota’s work normally resides in Japan, at the Itchiku Kubota Museum. A trip to Japan was on my bucket list, but it didn’t appear likely to happen anytime soon. …that’s me, standing next to the artwork that inspired my calling. It was amazing to see Burning Sun in person. Many artworks don’t live up to their photos when viewed in real life. But Burning Sun’s photos didn’t do it justice – not even close! – because an image of the full piece can’t capture the intricate detail. At this distance, you can see some details – stitched-resist (shibori) dyeing, delicate brush painting, and embroidery. Now you can see that there are two kinds of embroidery thread – rough silver thread at the middle right, and a smooth, glossy thread at top right. You also get a glimpse of the wonderful textures created by the shibori stitching. Now you can see that the base cloth isn’t plain weave – it’s woven in horizontal ridges punctuated by irregularly placed floats, creating a textured fabric with floating flecks of light. I spent two days in the exhibit, from opening until closing (though I did take a break for lunch on both days). I took 1,297 photos of the 40 kimono – though I wish I’d taken a few more, since I’ve found some gaps already. The first day I ran madly about documenting/photographing EVERYTHING, because I wanted detailed shots I could study later. Near the end of the second day, I had a few hours left, so I spent some time just looking at, and absorbing, the artistry in the kimono. I would really have liked a third day (or another three weeks, months, years…), but two was enough to get most of what I needed. Kubota’s work is inspirational to me in so many ways – the sweeping vision, the incredible technical mastery (across multiple disciplines! 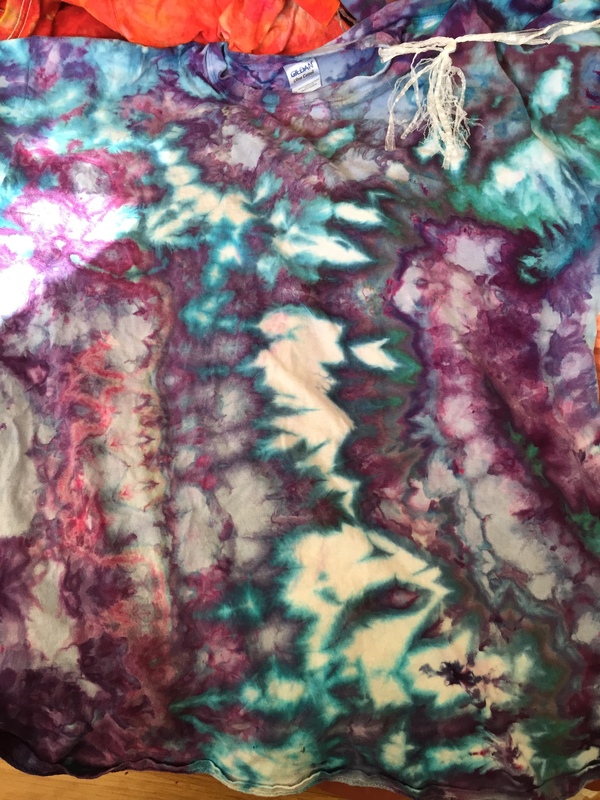 ), the integration of conceptually different design elements (physical texture, flat areas of ink drawing, shibori dyeing), and the ability to design at multiple scales, from the sweeping vista to tiny stitches. It is ambitious, masterful, and complex. I have never seen anything like it. Here are some hopefully illustrative photos. As you can see, when lined up next to each other, the kimono form a single sweeping image. In fact, this set of six kimono is actually part of a much larger set, that all merge into a single image. Here is a panorama with 13 kimono (you’ll have to click in to see the larger version; it’s hard to make out details if you don’t). You can see how the seasons merge into one another, late summer to fall to early winter. I believe that all the kimono of the Symphony of Light can be lined up in this way. What a breathtaking vision! While it was designed as part of a larger set, it also forms a complete composition when viewed by itself. I love this particular section because it’s almost all texture – but texture used in a deliberate and astoundingly precise manner to create movement, depth, and patterning. There are four textures just in this small section! And the textures are coordinated with subtle dyework to create the impression of layers of mist shifting over the mountain. What blows my mind isn’t just the technical excellence of the work but the multidimensional expertise needed to envision it. Each of the design components Kubota is using – texture, color, line – is created using a different kind of surface design technique. Each of those methods “thinks” differently. It’s hard enough to design using even one of those three methods, which is why most textile artists work inside a single branch of surface design. But here Kubota is integrating three very different methods in a single piece, combining them into something far more powerful. Here the shibori ridges create earth and tree branches. To get crisp definition in the tree trunks – not achievable with shibori – Kubota uses ink pen. And, because neither of those techniques produces luster or luminescence, Kubota’s decided to embroider the tops of the trees with scattered stitches in smooth, lustrous gold thread. This gives the effect of sunlight glinting off the treetops. Kubota’s work has had a profound impact on me because he worked the way I want to work, and his work shatters a lot of the constraints that were suggested to me as a budding artist. For example, I was advised to pick three or four techniques to work with, in a single medium. The idea is to achieve greater mastery by exploring one area deeply rather than trying to integrate a lot of unrelated methods. Kubota works with just a few techniques, but drawn from vastly different areas of surface design. It’s inspiring to me to see that this can work – because my natural inclination is to work across multiple disciplines. Trying to focus in a single area felt terribly limiting. I’m still processing all my thoughts and feelings about the exhibit. Seeing Kubota’s work has helped me recognize some of the limitations I’d imposed on myself, and reassured me that there is enormous potential in my multidisciplinary approach. The design philosophy embodied in his kimono is making me think deeply about what it means to me to be an artist, what I want to strive for in my work, and what I want to learn. And, of course, I’m also learning a ton about design by examining the work of a master. Kubota’s work is also making me feel enthusiastic about weaving again, which is great after a nearly two-year hiatus. I was seriously wondering whether I had made a mistake buying a jacquard loom, because I felt like I might be done with weaving. 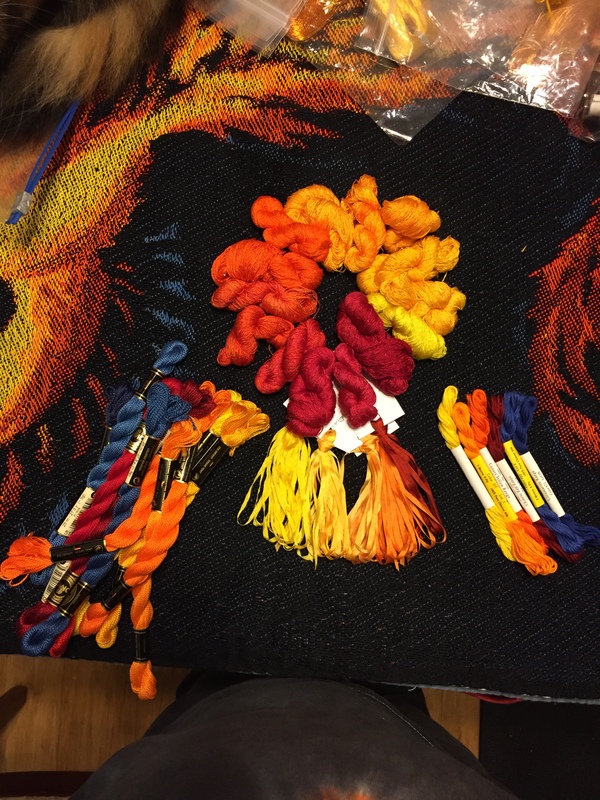 But seeing his work has made me think of some really cool stuff I could weave (and dye) – and I can’t wait to get started on it! Over the next couple weeks, I’m planning to write a series of blog posts about some of the thoughts the kimono have inspired – both philosophy and design. Stay tuned! 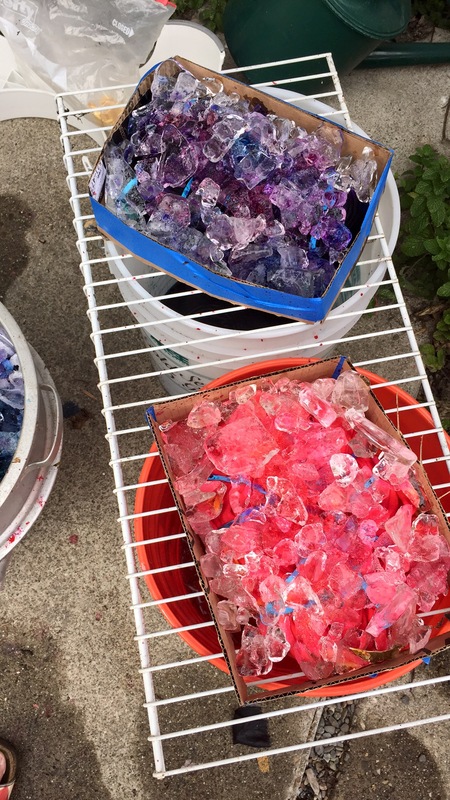 I’ve spent the last several days experimenting with ice dyeing. I had planned to set up the loom for triple weave, using two layers of ice-dyed cotton warp and one layer of white wool warp. 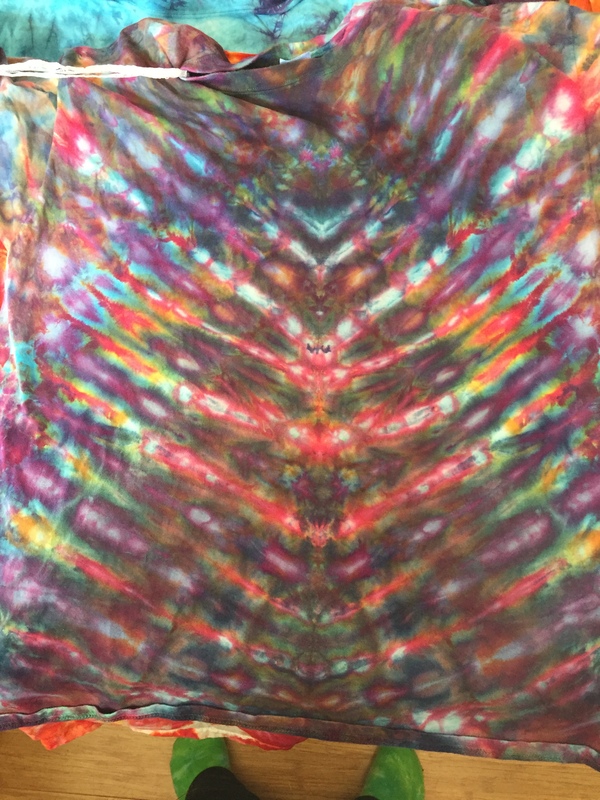 But since I hadn’t ice-dyed before, I decided to experiment with it before dyeing a long warp. 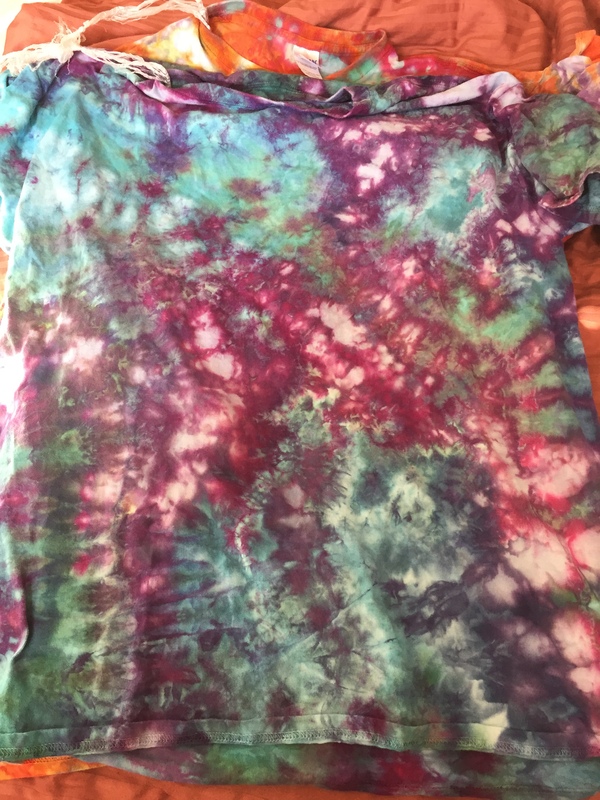 I decided to experiment on T-shirts, because T-shirts are the cheapest fabric I know of, and because I needed to expand my tie-dye wardrobe anyway (doesn’t everyone?). So I paid $33 for a dozen T-shirts at Dharma Trading Company, and off I went. Here’s a photo of the T-shirts in process. I cut up cardboard boxes, wrapped the cardboard around the T-shirts, and piled ice on top. 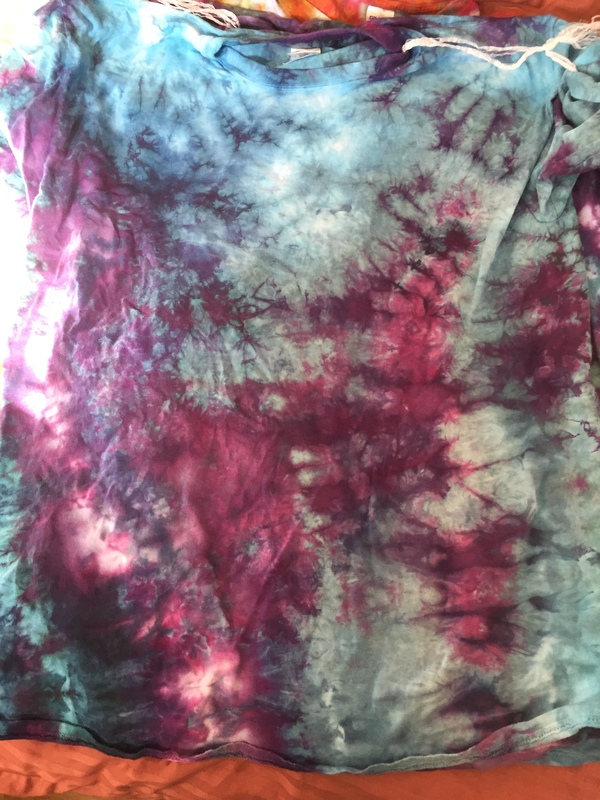 Then I dribbled on dye – red/orange/yellow and blue/green/purple, as I wanted to test both color combinations. And here are some of the shirts I got (primarily the blue/purple/green ones as the red ones mostly weren’t that interesting). 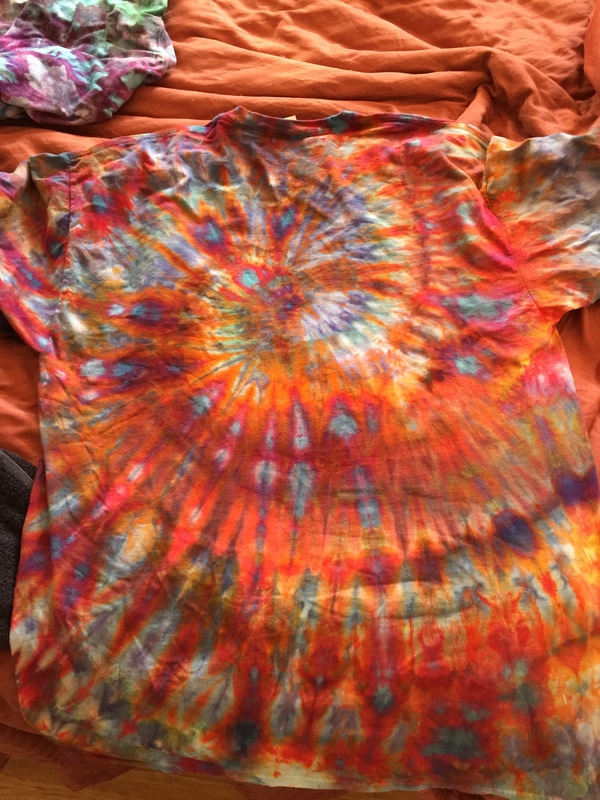 These were all scrunched up loosely with dye dribbled randomly on top, then flipped over and treated the same way. Of course, after I finished all my ice dyeing experiments, a weaving buddy blew my triple-weave plans out of the water by pointing out that I could do the piece much more simply if I painted the warp on the loom, rather than trying to dye two painted warps, then exchange layers throughout the piece. So instead of putting on a triple weave warp with ice-dyed warps, I’m going to put on a double weave warp, one layer of white wool and one layer of white cotton. That should enable me to weave all the pieces I’ve been contemplating. 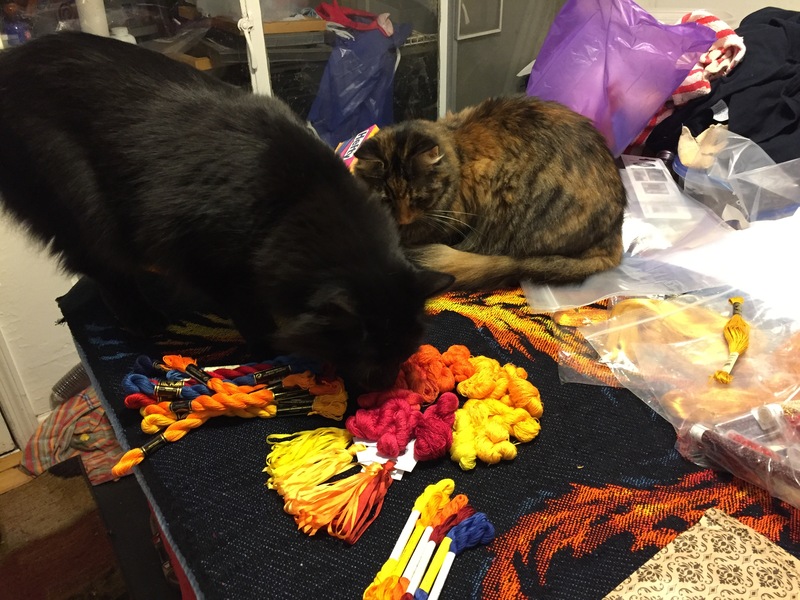 I think I may use the rest of the current warp to experiment with painting warps on the loom, rather than weaving the rest of the cat placemats. The cat placemats are cute, but also very laborious, and the central motif is not my own design, which complicates showing it to people. And it would be helpful to test whether the warp painting idea will work before I commit to a long and expensive warp. 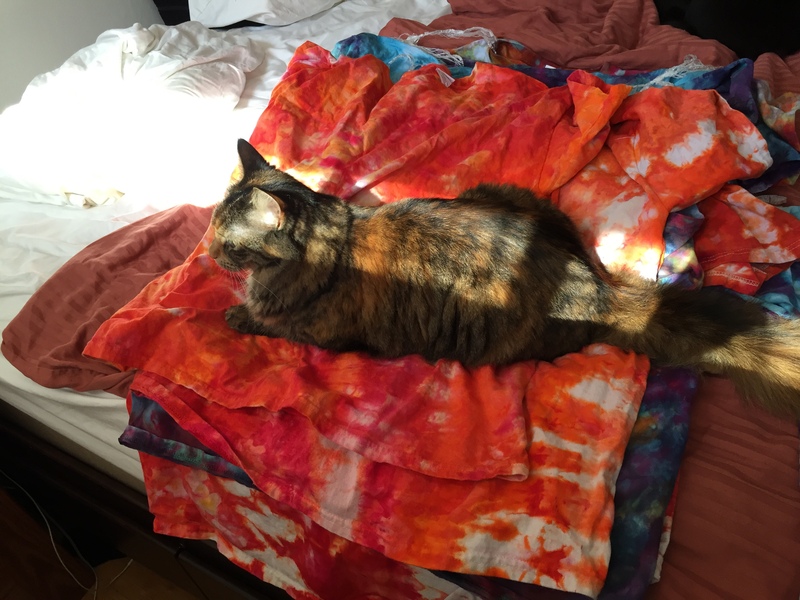 Speaking of cats, I decided to take a photo of the stack of tie-dyed shirts. Of course, as soon as I laid out the stack, someone decided to photobomb. 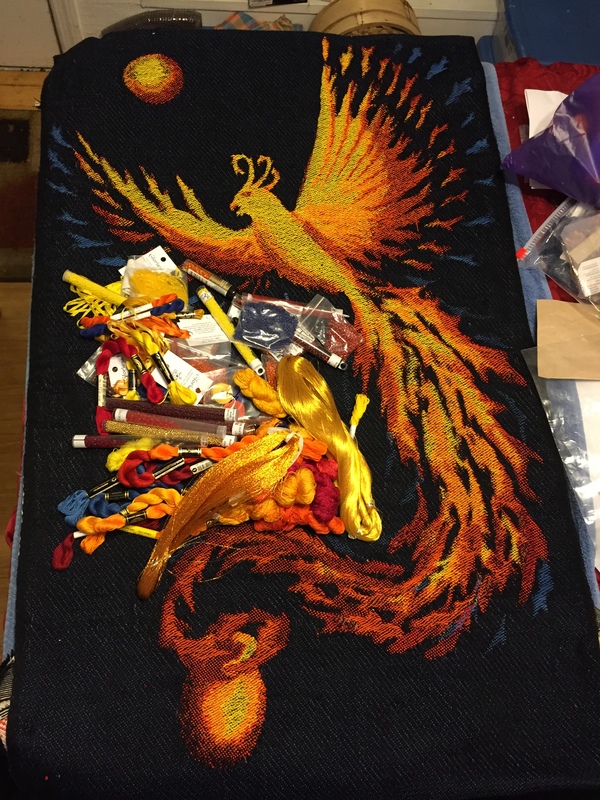 I’m traveling at the moment, but have found some time to work on the phoenix. I’ve been testing embellishments – mostly on the head, as that’s the most important part. Here’s what I’ve done so far: most of the crest feathers, the beak, and a little bit of the head. 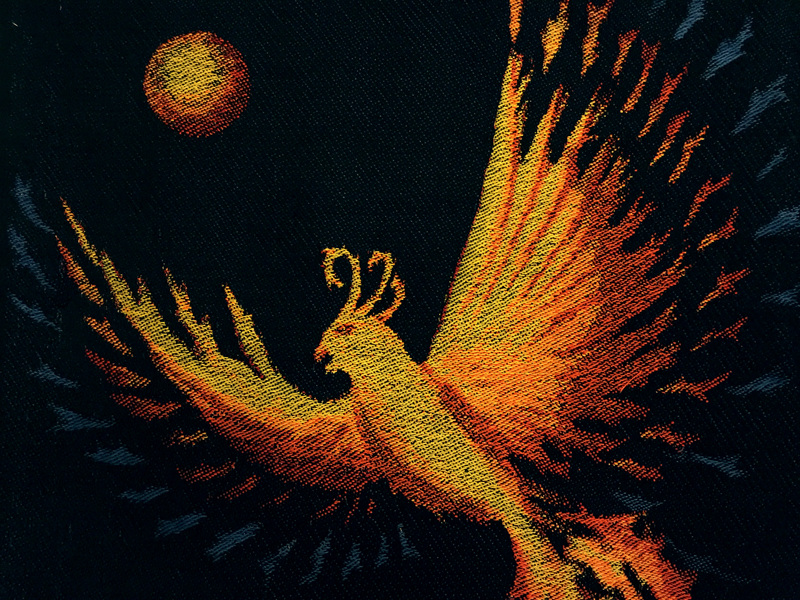 The embroidery, especially around the eye, adds sharp detail, bringing the phoenix into focus. I’m embroidering using DMC #5 perle cotton, which is similar to the weft in size and sheen. I tried using silk embroidery floss, but the finer threads looked out of place. I’m also using two metallic yarns: one very fine thread, used four at a time, to connect the beads to the crest feathers, and a much thicker thread (made with real gold!) for the center of the crest feathers. The thicker thread is too delicate to stitch with, so I’ve couched it down instead. Embroidery is going slowly, partly because the backing fabric I chose is too tightly woven to work well with the thick threads I’m using. Pushing the needle through the fabric takes significant effort, which is bad for my thumbs as well as my temper. I’ve already decided to use a coarser fabric for the real piece. I have some cotton or linen cloth from my mother’s stash that should prove suitable. As stitching the head has been very slow going, I had hoped to avoid stitching the entire body as well. Alas, my attempts at laziness have come to naught: the embroidered beak and part of the head look so much nicer than the original that I have decided to do solid embroidery on the entire head. And if I do the head, I really need to do the body, or it will look funny. Fortunately there’s enough division between the body and the wings/tail that, as long as I add a little bit of transition embroidery to connect the two, I shouldn’t have to do solid embroidery on anything else. I do intend to do more embroidery on the wings/tail, both to add a bit of metallic sparkle and to add some dimensionality to the feathers/wings, but nowhere near the amount I’ll need to do for the body. So the next step will be to test out my embellishment ideas for the tail. I want to add a little detail to the front feathers. There are two layers of feathers in the tail – this is obvious in the digital painting, but not in the woven piece. So the tail looks a bit flat right now; I want to make it look three-dimensional. I’m not entirely sure how I’m going to accomplish that yet. Maybe with ribbons, maybe not. Fortunately, I can experiment on the sample. Meanwhile, the cat-sitter has been sending us a ton of photos of our beloved cats, who look happy and healthy. 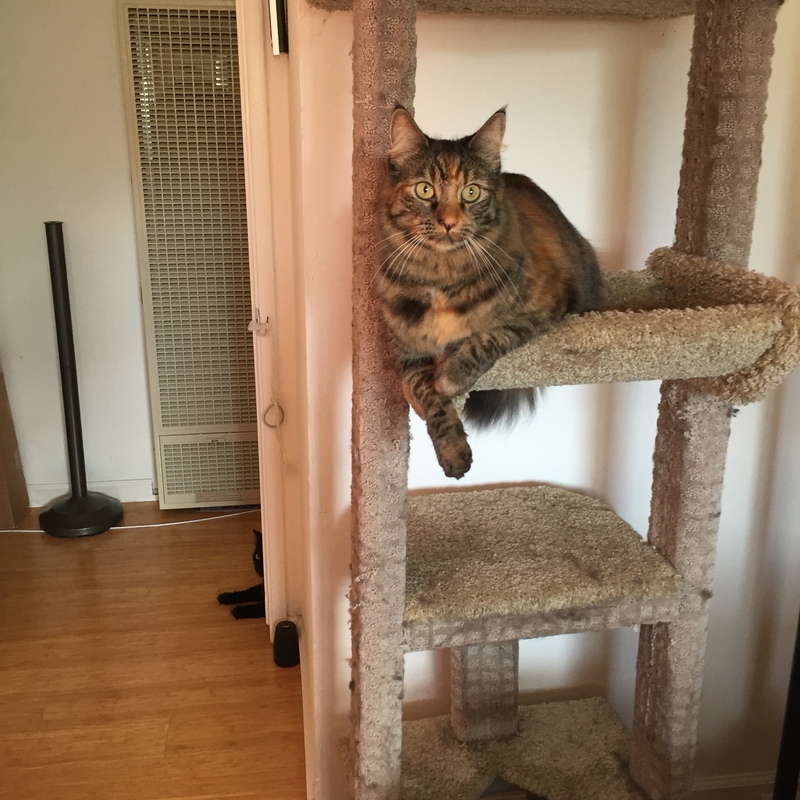 Here’s Tigress, hanging out in the cat tree. I’m heading off to the airport in a few hours, visiting family for two weeks. The phoenix is accompanying me, so I can work on embellishments while I’m traveling. In fact, it has its own suitcase! as there is a lot to bring: the phoenix, the sample version, the embellishments, the scroll frame on which to stretch the phoenix, a table stand for the scroll frame – the list goes on. But I am short on time, as the piece needs to be completed (or complete enough to photograph) by February 1, so I have only six weeks to finish it. And I am traveling for three of those weeks! So the phoenix is coming with me. Now, what am I planning to do with all those embellishments? Anyway, since the head and body are the focal point for the piece, they need to be more opaque and more detailed. So I’ll likely use a shaded satin stitch for the body (so I can have more subtle shading), with bits of metallic thread to add highlights. 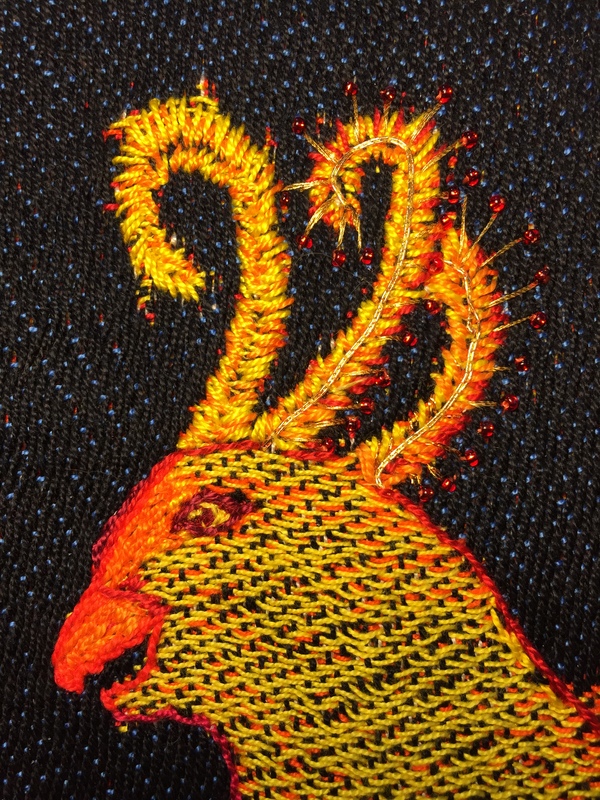 On the head, I’ll use a shaded satin stitch as well, but add more metallic thread and also outline the eyes and beak with different colors. 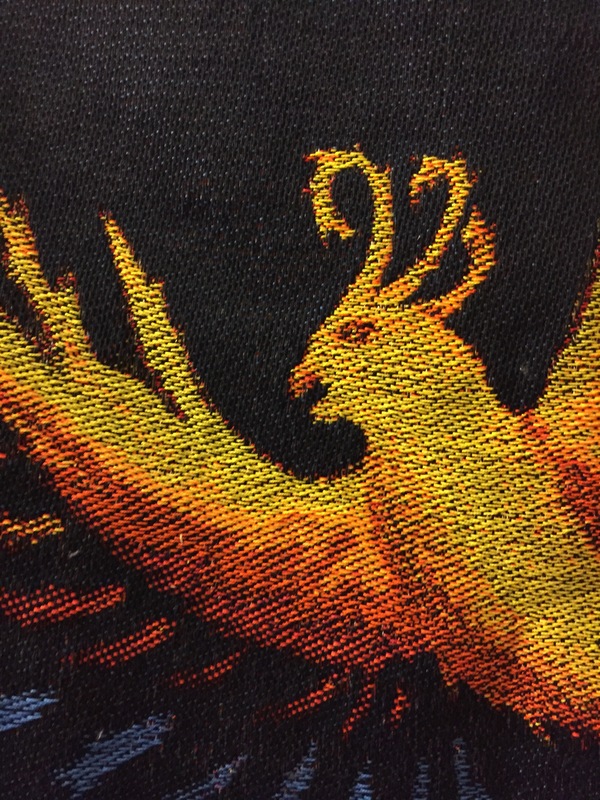 The crest feathers will get metallic threads and some bright yellow/orange beads. I also plan to extend some satin stitches out to the wings, to avoid a big jump in texture/appearance from the body to the wings. The wings will also get some metallic threads and possibly a little bit of embroidery to emphasize the upper edges of the feathers. I will likely add some beads – yellow/red/orange in the outer feathers, and blue/black in the blue areas. In the left-hand black area between wings and feathers, I’ll add some blue/black beads (they are sapphire around a black core), expanding out from the blue feathers in the wing. That will add a bit of subtle motion to the space, so it isn’t quite so empty, without drawing attention from the phoenix. 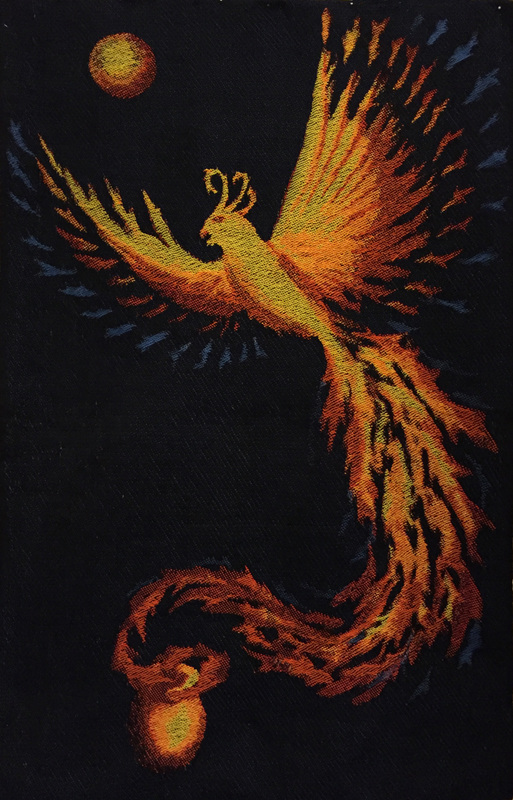 Here’s the entire phoenix again, so you can see what I’m talking about. The blue/black beads will go in the space on lower left, between the blue feathers and the tail. In the tail, I plan to outline a few of the feathers and embroider a few feathers to give the tail more dimensionality. There are two layers of feathers in the tail, which is clear in the digital painting but not in the woven cloth. I’m not quite sure how to outline the top feathers without losing the feeling of transparency at the feather edges – that will take some experimenting. I also plan to add a little glitter via the metallic threads, tapering off as I reach the end of the tail. I’m planning to outline the moon and the urn to make them more solid, and also to embroider my mother’s birth and death dates on the urn, to make it more clearly a cremation urn. And that’s it for now. I’m starting with a test piece, both to test out my embellishment plans and to practice my embroidery skills before starting on the final piece. Doing the test piece and the real piece in six weeks will be a real stretch, especially while traveling, but I think I can get it done.